On Sunday it was chilly in those hills. Real Autumn chilly – with a sweet, earthy smell of decaying, damp, mulching leaves underfoot. I wore my newly knitted Cobbled-Together Autumn Cowl. I stood in the middle of the forest while my kids ran around like wild things and the Mr went off on chestnut reconnaissance. I assumed that weird, taking-one-handed-photos-of-self, contortionist pose, tried to look like a happy cowl-wearing person and felt like a dork. 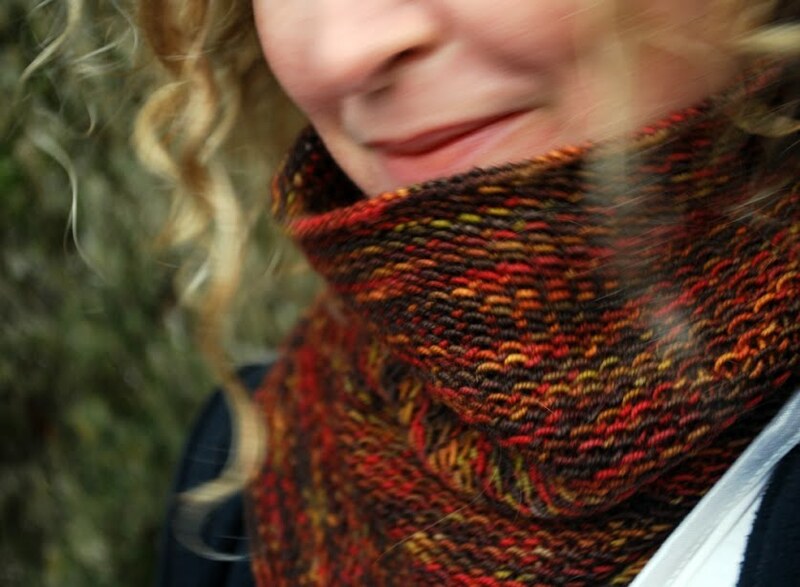 Ever since Monday it has been getting steadily warmer, with a weekend forecast bordering on perfection and there is very little chance that I will be wearing this cowl and taking better photos, without feeling like a bigger dork. 1. I know the Mr could take the photographs. But he always has an OPINION and then there’s disagreement and someone occasionally accuses someone else of behaving like a ‘dork’. 2. The Cobbled Together Autumn Cowl was supposed to be a Honey Cowl, but I failed to read the pattern, assuming I remembered everything from last year’s Honey Cowl. Twenty five centimetres into the knitting, I realised I was using a two row pattern repeat, not the required four rows. Ah, well. 3. 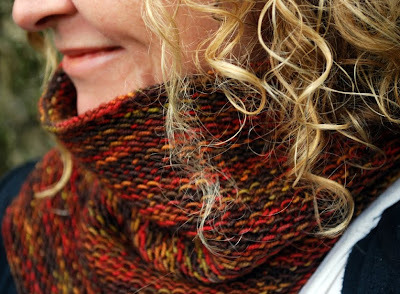 The Cobbled-Together Autumn Cowl was supposed to be a pair of socks. I have only ever knit two socks in my life. Both are odd socks, as they are in a different yarn and knit to a different pattern. As it happens, odd socks fit in well around here. Even so, given my current inability to make the same thing twice, choosing a cowl over a third odd sock seemed a sound executive decision. 4. Cobbled-Together Autumn Cowl details here. Again, my heartiest thanks to Alexis for her beautiful yarny gift. 1. On Wednesday the Mr and I went out on a DATE! and saw Daniel Kitson in Where Once Was Wonder. Fabulous. Sadly no tickets left for the remainder of this year’s Melbourne International Comedy Festival but the Mr and I have made a mutual decision to be groupies and join his mailing list and thank him exuberantly for any updates he emails. I know Daniel Kitson will love this. 2. I have decided to relaunch my career. Sort of. First I need to grow up and decide what to be. Not a sock knitter. You look beautiful. You iz a beautiful dork! Can I suggest a new career as my minder? I clearly need one. Your cowl is gorgeous, you look beautiful, no dork anywhere in sight! 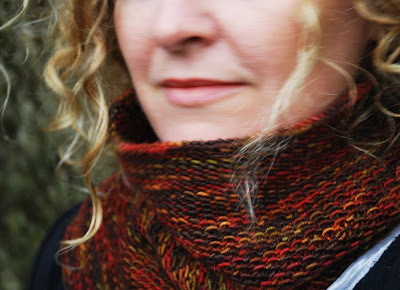 Love the cowl, cobbled together and all. I am soon to be condemned to a fifteen hour pane flight with three kiddos with me as the only responsible adult (ha!). Am wondering if a pair of socks is a good in flight knitting project. If it is all I have, surely I will get a pair done. On the relaunch of career - let me know if you do think of something. Am quietly dreading the imminent enrollment of the small girl in primary school. I know that one handed photo take all too well. The alternative is my kids take the photo....thankgoodness for the digital age. Love the cowl by the way. My Mr is shocking at taking blog photos as well. Just diesn't get it. Much easier to just do it yourself, I say, even if u look like a dork! Which I'm sure u didn't. ;). Loving the cowl. Still must get around to making myself one of those. My 13 year old neice informs me that photos taken of oneself are known as 'selfies' and are de rigeur amongst the hip young folk this season. So, not only are you not dorky, but completely on trend, my friend. The cowl and you are both really quite beautiful. I can't wait to see where you launch your rockets. The sky is no limit for a person with your talents. Let the countdown begin! I can't wait to find out what you want to be (other than a sock knitter of course)! Lovin' the autumnal look, ya gorgeous thing, ya. Que linda essa gola de tricô, a cor também é linda. I like the cowl! Very pretty autumnal colors. What is it like to go on a date?! I don't remember. Great selfies (?! )...ok, was just trying out being 'on trend', didn't feel that comfortable! I just wanted to ask that if you do work out what you want to be when you grow up, and then actually grow up...I'm keen on a tutorial for that one, or random musings would also be useful, if a tutorial is too much to ask. Had you not told us about the stitch deviation , I wouldn't have known . I would just have admired the cowl's lovely colours .... and the nonchalantly chic way you were wearing it . Thinking about a career change ? Well I'm retiring this summer .... fancy taking over ? Oh, you do make me laugh! I, too, often subscribe to the Dork society. Quite a few of us dorks out here! You know I love dork. and a gorgeous dork you are! YES DANIEL KITSON, fabo, have been a bonafida groupie for quite sometime and he is yet to dissapoint, seeing him tomorrow night. SUper excited to know another daniel Kitson fan. Hooray for autumn cobbled together cowl wearing dorks...I love it! 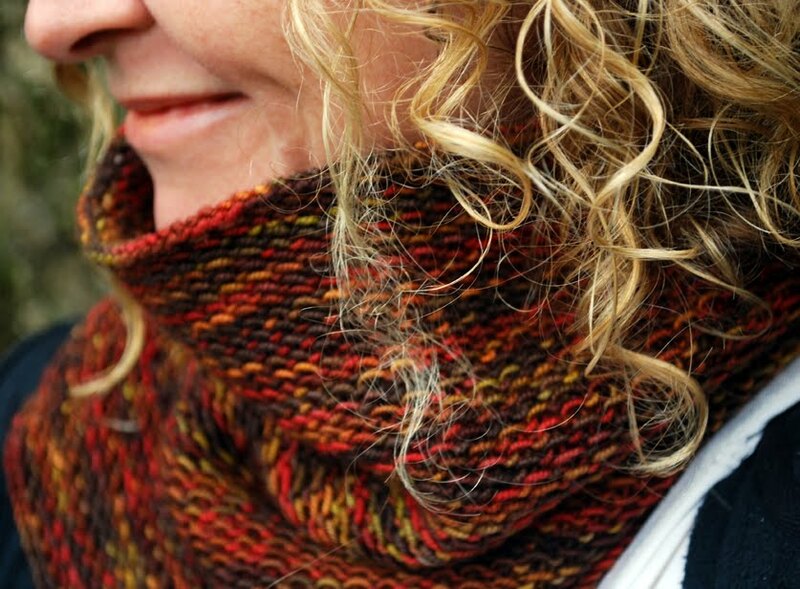 The cowl is lovely and so is that yarn. I have a husband here who is asking, hinting pleading for a pair of socks, I wear his 'made-by-me' socks to warm my feet as he complained that they were too small and I took them back. Looking forward to finding out what you do when you grow up. Beautiful cowl even if the wearer is a little dorky. Tis way better than a 3rd sock, especially as we only have two feet. The cowl looks beautiful and your cute too. Have fun deciding what you want to be when you grow up. I do want to be a sock knitter. The good thing about self-portraits in a cowl is that you avoid neck wrinkles, double-chins, crooked teeth so actually I think you're savvy, not dorky. Not that I'm suggesting you have any of those problems, but I always have at least one of them in any selfies I attempt. Good luck with the career-woman stuff. oh bum, just wrote you the wittiest comment ever and when I posted it disappeared! Finish with something poignant about those poor single socks, looking for love still after all this time. If I don't take 'selfies' on hloiday, it looks like I was the absent parent... Or a dork. How about being a portrait photographer for dorks...? When you figure out what to be please send some positive energy my way... I'm driving myself crazy trying to figure out what career #2 is going to be. Gorgeous colours, even if it's not at all sock-like. Thanks for visiting my blog- such a delight to find yours! We roasted chestnuts for the first time ever while we were campervanning, awesome! Love your dorkery and your knitting.